Omaha Hold’em is a very common community Poker game at most casinos. The game itself might seem similar to Texas Hold’em, but there are some differences. 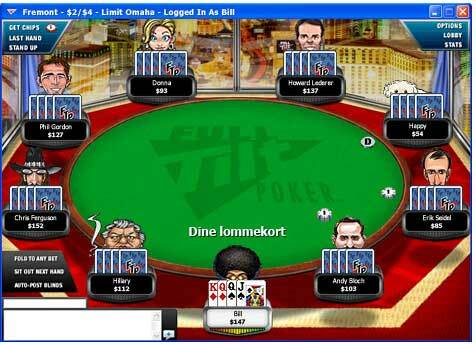 Here you will find how to play Omaha Hold’em in a simple and easy way. Omaha Hold’em is community poker with a total of 9 cards for each hand. Words explained: Bet-bet more money, Call-Go on, just match the previous bets, Check-do nothing when it is your turn, Fold-leave the game, Raise-increase the bet. Each player get 4 private cards, hidden from the other players. These four cards are called “pocket cards”. The dealer will also deal 5 community cards. Each player has to form the best poker hand with 2 of your private cards, and three of the community cards. The two first players on left for the dealer shall place a blind bet, half of the minimum bet. The next player left for the dealer shall place a small blind be. This is half of the minimum bet at the table. The player who is number two to the left for the dealer shall place a big blind bet, which is similar to the minimum bet at the table. Bet, Call, Raise or Fold. All players shall pay the same amount to the pot before the round is completed. After the first round the dealer turns 3 cards on the table. These 3 community cards are for all players to be used for the best poker hand. The player left for the dealer starts betting. If you play with limits are the bets in the second round similar the minimum bet. You have these options: Bet, Check, Call, Raise or Fold. All players shall pay the same amount to the pot before the round is completed. When the players have done their bets the dealer turns another card from the community cards at the table. The players now have 8 cards to make up the best poker hand. When the players have done their bets the dealer turns the last card on the table. The players now have 9 cards to make up their best poker hand. The remaining players now show their two hidden cards. The player with the best hand wins. If drawn, the pot is shared. As you can see, Omaha Hold’em and Texas Hold’em is quite similar, but in Omaha Hold’em the players have more cards on their hand. Hands with straight or flush is quite normal in this poker game. You must remember that you can use just 2 of the cards you have on your hand, combined with the community cards on the table. If not both these fits in a winning combination on the table, your combination idea will fail.